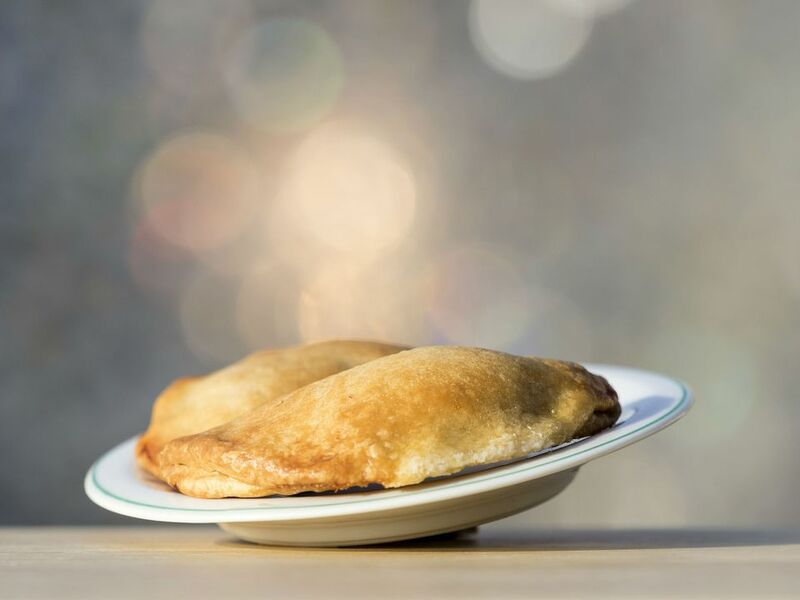 These vegetarian empanadas are filled with sweet corn and a creamy cheese sauce. If you prefer something heartier, add some barbecue chicken or pork to the filling. Prepare empanada dough and set aside to rest. In a heavy skillet over medium heat, sauté the onion and red pepper in the olive oil and butter until soft and fragrant (5-8 minutes). Add the corn and the water and cook, stirring, for 5 minutes more. Stir in the cilantro and cook for 1-2 more minutes. Remove from heat, season with salt and pepper to taste. Set aside to cool. Prepare cheese sauce: Melt the butter in a medium saucepan. Whisk in the flour over medium heat, stirring for 2-3 minutes. Whisk in the milk and cream, stirring continuously until mixture thickens and comes just to a boil. Stir in the cheeses and cumin, and season to taste with salt and pepper. Remove from heat. Stir vegetable mixture into cheese mixture and let cool (or chill in a refrigerator for a few minutes). Separate empanada dough into golf ball size pieces, and roll each one into a smooth ball. Let rest 5 minutes. On a floured surface, roll each ball of dough into a circle about 6 inches in diameter. Spoon 2-3 tablespoons of filling in the middle of the circle. Brush the edges of the dough along the bottom half of the circle lightly with water. Fold the top half of the circle of dough over the filling to form a semicircle, and press edges together firmly to seal. Brush the pressed edge with a little bit of water, and fold the edge over itself, pinching and crimping as you go to make a braid-like effect. (See Tips and Techniques for Beautiful Empanadas). Place empanadas on a baking sheet. Mix egg yolk with water and brush mixture lightly over the entire surface of each empanada. Bake for 15 to 20 minutes, until golden brown and slightly puffed.